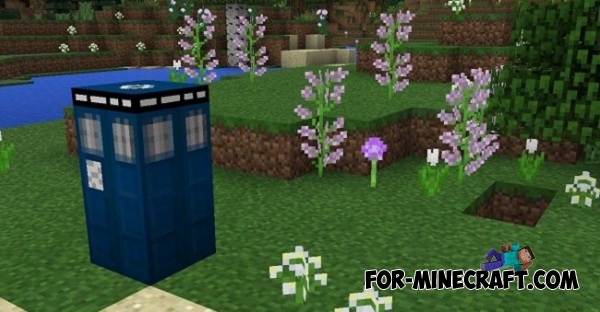 This modification adds a time machine - "TARDIS" in the world of Minecraft Pocket Edition. With this time machine you can travel back in time, and also move around the world in a split second. Added new block - "The reader of time line". Added new signs in the TARDIS. Added new item - wrench. To start you need to get the TARDIS. 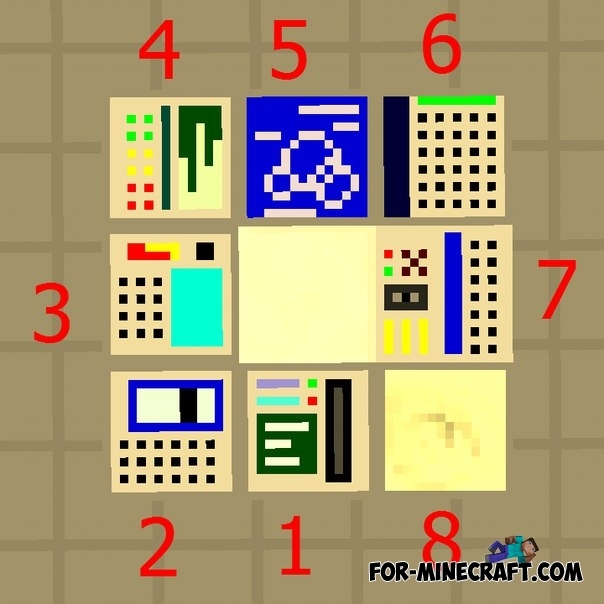 You can create it by yourself in a crafting table using crafting recipe. So you can get the TARDIS using Toolbox or Simple Commands. Then put it in a convenient for you place. Then click on the "Tardis", where is located the handle (white texture). 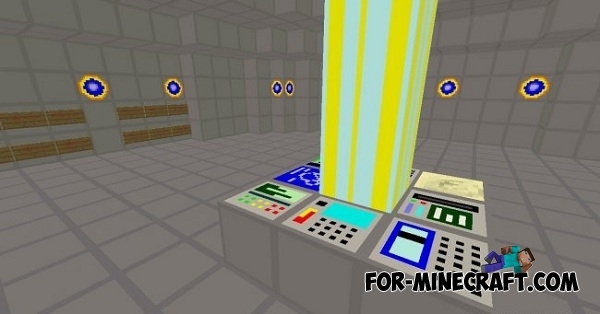 Then you move into the central control room of time and space. 1 block - block used to start the teleportation, click on it after setting the coordinates [x / y / z]. 2 block - saving block. The upper a sign - loading, bottom - saving. 3 block - getting a screwdriver. If you dont have a screwdriver, press on it. Screwdriver in this version need to remove the save (activate the save menu (block 2). Then click on the upper sign. 4 block - block is used to configure of the TARDIS. 5 block - a radar-block. Click on it and you will see information about the position and status of the TARDIS. 6 block - setting [x / z]. 7 block - coordinate setting [y]. 8 block - in the development. How to get out of the control room? If you want to leave the control room, click on the gray door. It is behind you. The modification is in the development stage. If you like the mod - please write a comment, what you think about it. Web community sign. Takes you to the official web community (in-game browser). Advertising sign. If you want to help the project financially while not spending a penny (in-game browser). Audio screwdriver (id - 2923) - It may change the status of Redstone mechanisms and open the iron doors (press on the lower block). It is necessary to save the the TARDIS. Wrench (id - 2924) - Wrench needed to create the TARDIS, if it has already been created in the world (if you suddenly die or the like). Click on the wrench key. Turn on support for mods, and then click "Add." Now you need to find the downloaded mod in your device's file system and click on it. 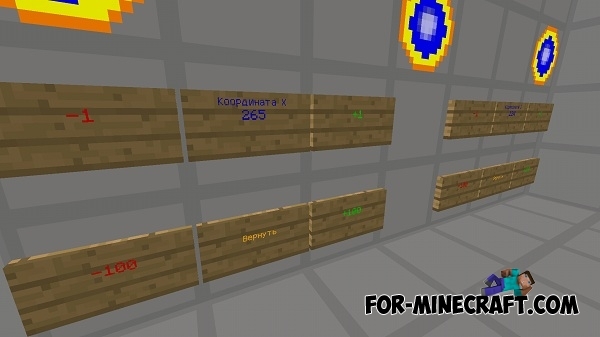 Textures will be installed automatically! Mod is installed, an enjoyable game! 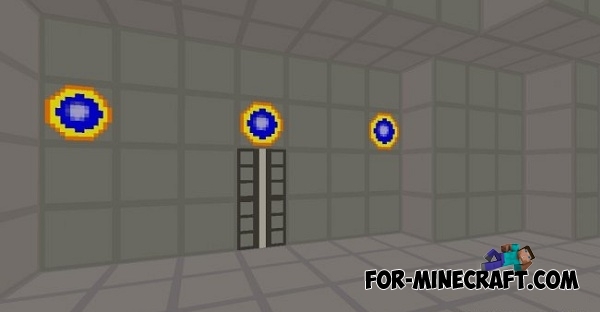 Super Door Operator 2000 Mod for MCPE 0.10.5Super Door Operator 2000 Mod will add an automatic door system in Minecraft Pocket Edition, which can be opened and closed in stand-alone mode. What does it mean by configure the TARDIS? Please email me thank you.